First of all, my CG had a celebration for March babies.. Believe me, there is many of us who born in March.. 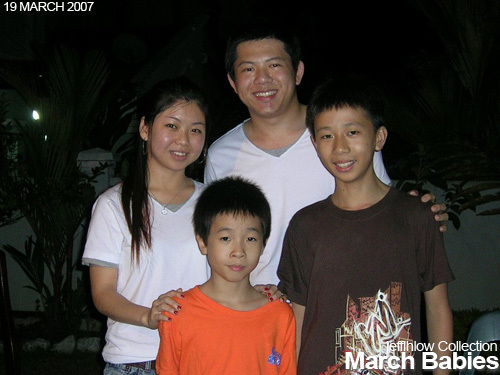 The celebration took place on 19th March 2007 at Patrick and Patâ€™s home. The food were great, I had 2 serving and believe me the nasi lemak is the one keeping me going together with the chicken rendang. We chill around and we share story of our love life, how we started, how we progress and how it happen. I remembered a few of the story from Ester, Pat, Peter Ting and David Oh. It was great to know everyone struggles in relationship and none of them go through it at ease. Commitment, scarifies, faith and courage are applied in everyoneâ€™s relationship to make positive outcome of everlasting love. 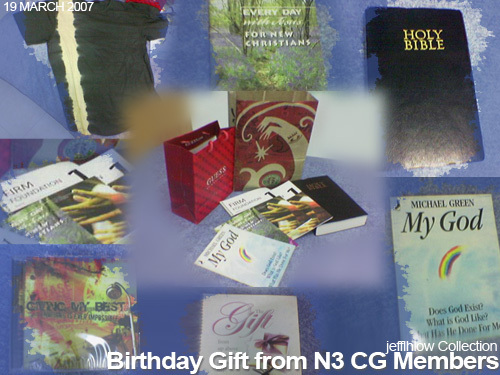 My N3 CG members gave me a Birthday Card and GMB â€“ Nothing Impossible ORIGINAL CD. I am blessed as I love GMB very much, they inspired me and they show me the joy in City Harvest Church. Patrick and Pat gave me a T-shirt very much likely to our City Harvest Fashion. Hahhaaâ€¦ Loving it! Not missing out my beloved Online Buddy turned Friend turned Brother and Leader of my CG, David and his beloved Shirley gave me a book from Michael Green â€“ My God, a New Christian Guide book and a Holy Bible (NKJ version). Itâ€™s wonderful to have such blessing for my birthday. City Harvest Church had given me a free seminar of Pastor Pat Mesiti which teaches me a never forgetting phrase that means a lot for me. 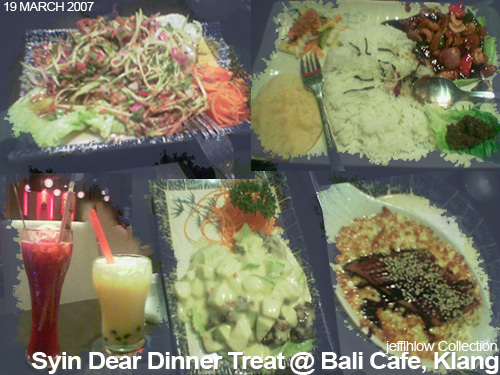 On my birthday, Syin make an effort to leave work earlier and meet me at Sunway Pyramid and she treated me dinner at Bali CafÃ©, Klang. I am blessed that she made that effort to come all the way to meet me. 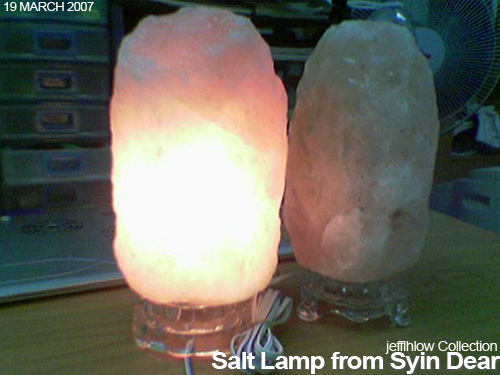 SheÂ alsoÂ bought 2 Salt Lamp for me, she says thatÂ itÂ is good for my health. HowÂ sweet she thought for me! Thank you everyone for the great celebration. I am blessed. Praise God. This is not just all that make today special that I have to blog 2 parts. 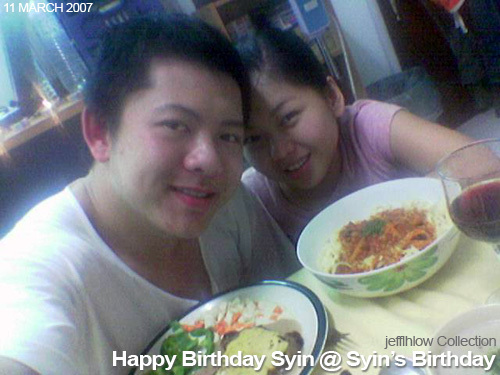 Tomorrow is going to be Syinâ€™s birthday. I already had a plan to give her a special treat on her birthday eve as I canâ€™t celebrate with her on Monday. It was because she is having family dinner at Teluk Gong. Alright, the maincourse I am going to cook is Chicken Chop with extremely yummy mushroom gravy and salad with extremely tasty French dressing. 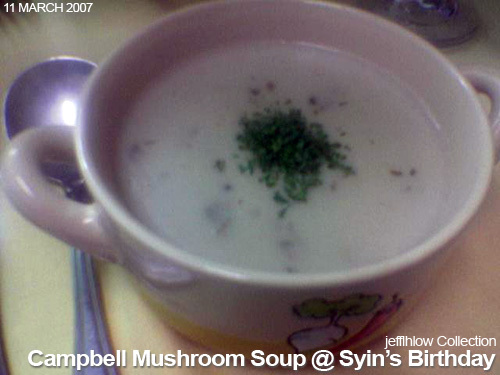 Comes the starter standard tin in a cup Campbell Mushroom Soup. Special add-on, just in caseâ€¦ Really just in case my Chicken Chop becomes Chicken Smoky, it is also my specialty that is Classic Spaghetti with PREGO sauce. I start to gather the entire ingredient; I marinated the chicken chop with soy sauce and salt and left it there for about half hour. Next, I boiled the spaghetti with hot water with some olive oil and also I heat up the Campbell Mushroom Soup in can. Meanwhile, I get some garlic, onions, tomatoes and some vegetable; chopping and slicing them into desirable size. After that, its time to get the chicken into the pan, I heat up the olive oil using medium fire on stove then I place the chicken chop into the pan and fried a little. I leave it for 2 minutes before flipping it and I put some garlic and butter to make the chicken chop more tasteful. Approximately about 10-15 minutes in the pan, I put a CHEDDAR cheese slice on top for it to melt. The chicken chop is ready to MAKAN! The best chicken chop in room! 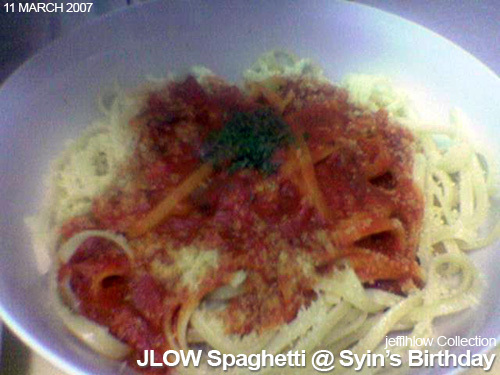 Not forgetting the spaghetti, I had poured the hot water away and place spaghetti in a bowl. After that, its time for the sauces; I use a PREGO Thick Tomato sauce in a can and heat it up. The sauce looks simple and not much tasty except for the strong tomato flavor. I add a portion of the Campbell Mushroom Soup after I pour a bowl of it and the remaining I pour into the PREGO sauce and mix it. Thatâ€™s not all; I add some garlic and MUSTARD sauce. MUahahahhaa.. Believe me, it taste delicious. Everything seems to be done and Syin come over to help me carry the dishes. While she was busy organizing it, I sneak up to my room and lock the door. OK! Here is what I did; I got small table and a big yellow table cloth to be our dining table. 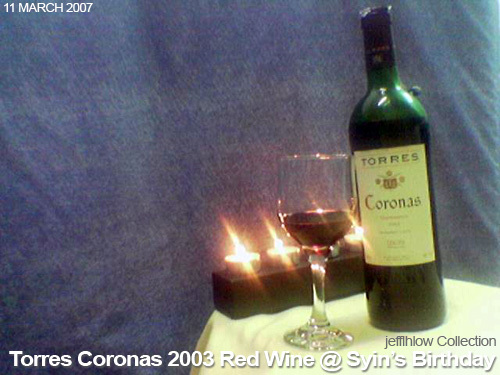 I already prepared a bottle of RED Wine, 2 wine glasses, exclusive utensil, tea-light candle and table cloth. I place a covered so it doesnâ€™t look like a bedroom while we dine. Next, music atmosphereâ€¦ Hmm.. That should be BOSSA NOVA. Hahaha.. Damn budget man! Once I set up the table ala American fine dining style, I unlock the door and carry the food together with Syin. The minute she steps into the room, she was all smiling and I know deep down inside she very happy and she wanted to show me how much she loves the settings. We had our lovely dinner and everything seems right. 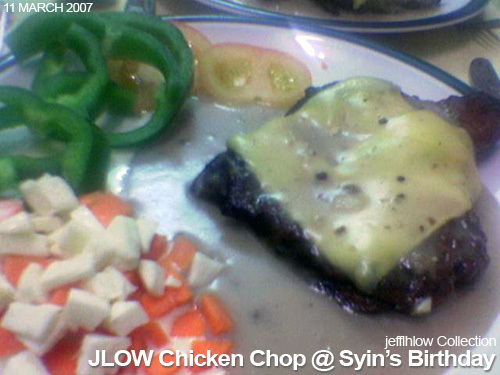 The food is great except for the chicken chop that was quite salty.. The atmosphere is indulgingâ€¦ The whole things just work fine and I conclude a great birthday prezzie for Syin. Later after the dinner, her dad called and ask her to get home quick for another celebration. Wellâ€¦ We left the things as it is and I send her home as fast as I could. Today it was a great day for me and it was the most beautiful things as a Christian for the 1st day. I felt Fatherly love the whole day. Thank you LORD, for sending Syin into my life, to be my companion and cherishing my love. Father of Lord Jesus Christ, please bless Syin with strength she require to live. Bless her with wisdom she needs to be successful. Bless her with strong faith so she will be able to reach out to Glorify You. Thank you LORD. We Praise to You. I’ve upload the video of the event. Check it out by click here.